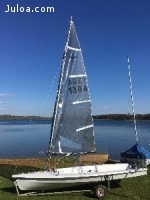 Frensham Ponds Sailing Club Surrey is in a nice central location for southern travellers to get to easily. First start 11.00 with 2 races in the morning and 2 after lunch of about 40mins each. See club website for NOR and directions. Easy launching off jetties and no weed on a picturesque lake. Free tea too !! A beautiful days sailing was had by the seven visitors and two locals at the first Eastern area meeting of the season. The wind direction was perfect for the venue allowing a windward leg for the full length of the pond, returning to the leeward end via a series of reaching and running zig zags. The sun shone, 10 to 12 knots plus the odd gust to catch some out, no weed and plenty of water, a perfect day to sort out the boat speed after the winter. Boat speed had not deserted Matt who proceeded to get three straight wins, only having to work in the second race where Nick led round the first mark having made a superb port tack flyer at the start. In the 1st race, Matt was followed home by Nick and Tim P.
In the 2nd race Matt had to work a little harder, with Nick leading for the 1st couple of marks, Tim P. was initially 3rd but decided the water looked so inviting a protracted swim was called for! This let Paul through to 3rd place. The final race saw Matt disappear into the distance follow initially by Tim P. and Nick, this time it was Nick who opted for a swim allowing Graham up to 3rd. Thanks to Fishers Green for a well-run meeting, super food and hospitality. The next Eastern Event is The Eastern Area Championship at The Royal Harwich Y C on the 21st 22nd May. 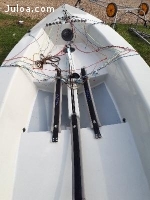 Two travelling phantoms were warmly greeted by the two home sailors on a chilly morning at the picturesque Wimbleball sailing club and got the boats set up before an excellent breakfast from the galley. Race officer Tony Paine gave a humorous and relaxed briefing expaining the traffic light starting system and course. The wind ranged from 10 -16 mph and was very gusty. With no recalls and Simon Hawkes taking a clear lead that he extended to the finish. Paul Birbeck back in a borrowed boat, Steve Popple and Ivan Walsh tussled with places being swapped and finished with Steve 2nd Paul 3rd and Ivan 4th. The hard working galley volunteers provided a delicious choice of lunches and birthday boy Steve treated us all to the shepherds pie. Refuelled for the afternoon race 2 was another clean start with Simon taking the lead and again place swapping only this time Paul getting the better of Steve for 2nd and Ivan a close 4 again. Final race 3 another fine start and a familiar flying Simon being chased hard with Steve capsizing and Ivan hailing 'you didn't want to do that' as he sailed by in pursuit of Paul. Having caught Paul, Ivan fully hiked was caught by a wind shift and tipped it in to windward. Paul showing genuine concern for his visitor hailed 'are you all right' as he and smiley Steve sailed past. Steve took 2nd Paul 3rd and Ivan 4th and Simon kindly waited on the slipway to catch us in the on shore breeze. Well done on a convincing overall win to Simon Hawkes. During prize giving Simon awarded Ivan swimming lessons !!! We would like to thank Wimbleball volunteer members on and off the water for their hospitality organisation and high quality racing. We would like to thank Exmoor Ales for sponsoring the event and Optimum Time Watches for sponsoring the 2016 Southern Travellers Series. Optimum Time Watches have very generously offered sponsorship of the 2016 Phantom Southern Travellers Series. Looking forward to 6 great venues for some great racing in a great boat!! A massive congratulations to Will Gulliver for winning the 2015 Phantom National Championships.